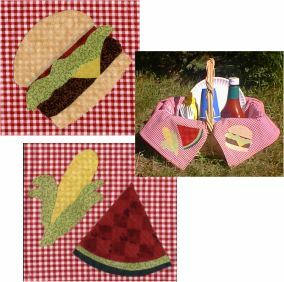 Use these cute picnic patterns to make a picnic basket liner or to decorate a picnic tablecloth. Either purchase a ready made small tablecloth or small finished cloth square like a table mat or large cloth napkin to decorate. Print the patterns from the links above. To make the appliqué pieces check the manufacturers directions on your fusible web and follow one of the methods given here. Trace the pattern onto the web side of the "Steam-a-seam" and peel off paper liner. Stick the "Steam-a-seam" to the wrong side of your fabric. Cut the "Steam-a-seam" and the fabric together along traced lines. On a flat surface, turn the fabric so that the right side is laying down and the wrong side is facing up. Lay the pattern pieces onto the wrong side of the fabric. Trace around each pattern piece with a pencil. Cut out a piece of fusible web just a bit smaller than the square, but covering all your pieces. At each corner of your basket liner cloth measure from the corner inward 6 inches and mark with a pin. Arrange the pieces of the design, as shown in the pattern, onto the liner cloth in the area below the pin. When each piece is correctly positioned, lay a thin cloth over the pieces and press a hot iron down onto the pieces and hold for 20-30 seconds. Add any additional layers of pieces, lay a thin cloth over the pieces and press with a hot iron again for 15-20 seconds. To make your own basket liner cloth first measure your picnic basket. Measure the inside of the basket from the top edge, down into the basket, across and up to the opposite edge of the basket. Measure the other direction of the basket by doing the same thing. Cut out two pieces of your chosen fabric at the measurements you have established. Place wrong sides together and pin in place. Stitch (1/2" seam allowance), pivoting at corners, around entire square leaving an opening of about 6 inches along one of the four sides. Turn right-side-out through opening and press along all edges. Edge stitch around the entire square to finish. Use these patterns for the picnic basket liner shown or decorate a small picnic tablecloth.